Try Making Your Own Eggnog. Here is a quick and easy recipe. Leave the pre-made eggnog on the grocery shelf... a top-notch, home-made eggnog is not much work. Booze: Bourbon, brandy or rum are the typical choices. You don't have to go expensive either beacuse the booze flavor is complimented by the flavor of the eggnog, so it all tastes great. Eggs: Pre-made eggnog (egg cream) may not have any eggs in it at all. Real eggnog contains eggs and the key is to buy them local and fresh if possible. Spices: The key spice in eggnog is nutmeg. Get it fresh ground from a spiece house or even consider grating it yourself. The store-bought stuff in a little can often has been sitting around for awhile and will not have the incredible aroma and taste of fresh nutmeg. Sugar: Don't try and make eggnog a healthy drink by using a sugar substitute. Make your eggnog with real sugar but drink less of it to lower the calories. It will have a better taste based on how the sugar reacts with the other ingredients. Here is the recipe, compliments of Derek Brown, a professional bartender in Baltimore that was adapted from a Gourmet Magazine article in 1945. Separate yolks from egg whites, set egg whites aside. In a large bowl, beat the egg yolks until light and lemon-colored. While continuing to beat, add the brandy, rum, sugar, milk, heavy cream and salt. In a separate bowl, beat the egg whites and nutmeg until they form stiff peaks. Fold the whites into the yolk mixture. Serve in punch cups. Eggnog will last for weeks in the refrigerator, so this can be made ahead of any special event. Make sure to store it in a glass container - bottle preferred. 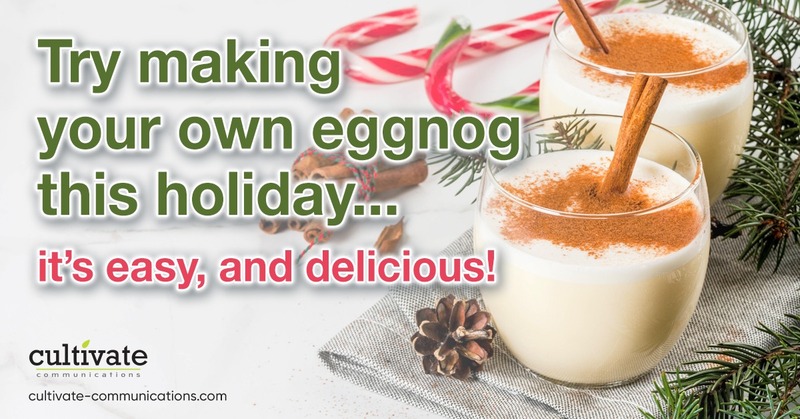 Raise your cup in a toast to home made eggnog this year!